My stern, religious upbringing had many rules – only certain clothes could be worn, no TV, radio or even organized sports. All the rules didn’t work well with an inquisitive child that constantly asked, “Why?” I formed some tough views about God, seeing him as harsh and judgmental. I rebelled during my teen years when my questions became actions and I pushed the boundaries. I not only rebelled against the rules of my parents and their church, but also against God. Because if following that God meant following a list of rules, I didn’t need God in my life. At seventeen, a friend and I decided to go to a Christian concert. I normally didn’t listen to Christian music, but my interest was peaked, because the singer was local girl about my age, who had just released her first record. I bought her album that evening. I got home around eleven and everyone was in bed. My parent’s bedroom was on the first floor next to the living room, which is where the only stereo in the house was. I knew there would be trouble if I used that stereo. I found an old record player in the attic and brought it to my bedroom on the second floor. It had been in the attic at least five years and I wasn’t sure if it would have a needle. (remember those) Thankfully, not only did it have a needle, but the needle was in good condition. I was surprised at my boldness – expecting to be hit with lightening. When no lightening came, I slowly tried to play the record again. If you would have peeped in my window a minute later – you’d have seen a shaken 17-year old girl sitting on the edge of her bed with the words and music of the album flowing perfectly from the record player. I was both thrilled and scared. Thrilled it worked and that there was more to life than I could see. But I was also scared of that very fact – and what, if anything, was I going to do about it? I’d like to tell you that I started seeking more that day. But no, I learn slowly. I pondered it. Then reason set in and I excused it – it wasn’t God or anyone else. 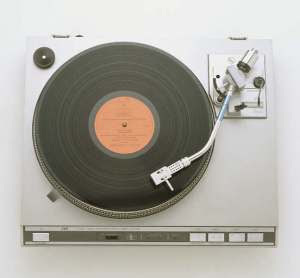 The turntable had just needed some time to loosen up, to get the dust bunnies out of it – that’s all it was. Yet, the inner stirrings of my spirit were too real to ignore. I knew it deep within even as I went on with my life in the normal way. Slowly over the next few years, step by step, I was drawn to learn more about that stirring. It’s been a bumpy path, but when confused, I come back to the confidence I had the night my creator connected with me through a dusty record player. Is there a time/place in your life when something was stirred within you and it changed your life? Kathleen – not sure what a 2×2 is? I was raised very traditional Mennonite (think almost Amish) We meet in basic, simple church houses. And yes, it is a joy to live in freedom!